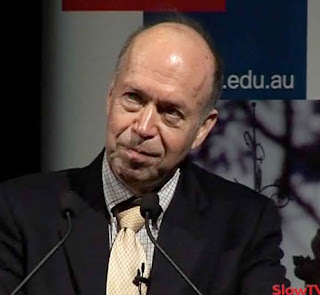 Climate science and James Hansen misrepresented. When Cox and Stockwell submitted a reply to the ABC, the ABC refused them the right of reply. At a time when the Gillard Green Coalition is trying to substantiate its despised carbon (dioxide) tax and has issued a rushed flawed report by Will Steffen (see previous) , the ABC, Man-made Global Warming propagandists (see here) probably though it unwise to publish the reply. Hansen Redux: service and disservice. We thank Dr Davies for his response to our recent Drum article, as it provides an opportunity to discuss additional elements of the long, but interesting paper by Dr James Hansen. By Hansen’s own account, the magnitude of the error by the models is almost half the entire forcing generally attributable to warming from human emissions of CO2 [AGW].This is a new development. It is not 'business as usual' as Davies portrays. Davies's main complaint is that our article does not adequately highlight Hansen's so-called “Faustian bargain”. This is that humanity has been getting away with CO2 emissions because aerosol cooling has been masking the CO2 heating. While we did mention it in the interests of balance, the problem is that the trade-off is a classic strategy of irrefutability of an auxiliary hypothesis, ala Popper, by correcting other errors such as ocean heat uptake and ocean warming with unmeasured aerosol cooling. At this stage Hansen’s remedy of greater cooling from aerosols is only speculation; speculation that contradicts Hansen’s previous work which concluded some warming from aerosols. We wholeheartedly agree with Hansen on the need for direct empirical measurements of aerosols to diminish this major source of uncertainty. But this has not been done and in fact nearly all the forcings that Hansen relies on to support the worsening of AGW are, according to the IPCC’s 4th report, either unmeasured or very uncertain. Yet we are told by Davies that he and Hansen are certain of their effect, in conjunction with CO2, on the climate. How can that be? This blurring of the distinction between fact and speculation is habitual in climate science and exasperates scientists from other fields. Our article did not review well-known views, such as Hansen’s argument for CO2 climate sensitivity. It focused on the new information, which was the overestimation of heat absorption in the ocean by Hansen’s computer models. This is not in dispute. Davies concedes this. Like Hansen, Davies assumes that the estimation of the cooling effect of aerosols by the computer models must be less than the actual cooling by aerosols. Why? Because, he claims, the evidence for global warming by CO2 is NOT supplied by the models, but by other ‘real’ evidence. This misconception is part of the disinformation put about by the professional deniers funded by the likes of ExxonMobil. If this is the case, then why then have IPCC computer modelling studies been used to determine the contribution of CO2 to global warming in the last half-century and why has Hansen been at the forefront of that process? As noted, in our original article we did not deal with the wider issue of AGW, but in respect of Davies’ distinction between the computer models and ‘real’ evidence we can say that the ‘real’ evidence shows even greater departure of models from reality, as the most recent forcing estimates of 0.23 Watts per meter squared is significantly below the 0.6 Watts per meter squared predicted by Hansen from the GISS model for the time period 1993 to 2003 (see here). In addition we are not professional deniers funded by anyone. We are, however, familiar with Hansen's palaeoclimatic ‘real’ evidence for 3C ‘fast’ climate sensitivity to CO2 doubling, as we are with a number of other findings of ‘fast’ climate sensitivity of less than 1.5C: Douglass, Shaviv, Spencer, Schwartz, Lindzen, Idso, McKitrick, and Scafetta to name a few. The main palaeoclimatic ‘real’ evidence put forward by Davies concerns the infamous CO2 lag where CO2 changes supposedly follow temperature changes. Using the same graph, which Davies does to illustrate this supposed lag of a few hundred years, Frank Lansner, also retired, shows that, in fact, there is no relationship between CO2 and temperature. The supposed lag of CO2 disappears when the graph is examined properly. The graph shows that temperature actually drops when CO2 is at its maximum levels and therefore maximum warming capacity. Davies like other people makes the mistake of only looking at the graph when both temperature and CO2 are increasing not when CO2 is increasing and temperature is DECREASING. This lack of a relationship between CO2 and temperature is also seen in the recent record with temperature going the opposite direction to CO2 from 1940 to 1976. Then, as now, an unmeasured human aerosol cooling effect is invoked. The remainder of Davies's article are obvious non sequiturs. It is not clear why, but Davies repeatedly draws attention to the draft status of Hansen's paper (which has since been published at the Cornell archive), and so creates the impression that it contains significant inaccuracies. We simply found it refreshing that uncertainties raised by climate sceptics over the years are beginning to be acknowledged by someone like Hansen – that sea level rise has decelerated from 3.1 to 2.3 mm/year, the importance of enhanced indirect solar influences proven in recent cosmic ray studies, that CO2 sinks are not becoming less efficient, the large uncertainty associated with aerosols, clouds, and of course, that the climate models are more uncertain than are usually portrayed – but fear these may fail to make the final version. Once again, we ask the question, based on the poor performance of the models against observations in recent years: do we really have an adequate scientific case that demands a policy response? More generally if policies are implemented on the back of a one-sided presentation of the science, then it is those policies and science which do society a “disservice”, not us. Do the 678 scientific studies referenced in the CO2 Science document, or the thousands of studies cited in the NIPCC report, provide real-world evidence (as opposed to theoretical climate model predictions) for global warming-induced increases in the worldwide number and severity of floods? No. In the global number and severity of droughts? No. In the number and severity of hurricanes and other storms? No. Do they provide any real-world evidence of Earth's seas inundating coastal lowlands around the globe? No. Increased human mortality? No. Plant and animal extinctions? No. Declining vegetative productivity? No. More frequent and deadly coral bleaching? No. Marine life dissolving away in acidified oceans? No. Quite to the contrary, in fact, these reports provide extensive empirical evidence that these things are not happening. And in many of these areas, the referenced papers report finding just the opposite response to global warming, i.e., biosphere-friendly effects of rising temperatures and rising CO2 levels. Dr Davies should rethink his position. As is indicated by the “Do you support the Greens' plan on emissions trading?” poll (http://sarah-hanson-young.greensmps.org.au/polls/do-you-support-greens-plan-emissions-trading) the ludicrous position adopted by environmrentalists, politicians and the power hungry on the cause of any changes that are occurring in the different global climates being our use of fossil fuels is rejected by the vast majority of thinking Australians. It is the same elsewhere in the world. Only the gullible (especially the young) or those with other agenda support this position. Although there are those who may love to think that humans are destroying the earth and pouring out poisonous carbon dioxide all over the place they are in a tiny minority. Minority groups around the world have all sorts of weird beliefs which have no substantial scientific basis and the Catastrophic Anthropogenic Climate Change (CACC) belief is among them. If each of us reflects carefully enough on our own way of life and all of the human-made changes to the environment that humans have made over the millennia then we realise that, despite the mistakes made along the way, the vast majority of us enjoy a far superior way of life that our predecessors, even just a century ago. Yes, there are those who are suffering unnecessarily and those who are overindulging themselves, but that has always been the case. There will always be the power-hungry, the greedy, the selfish, the gullible and the cowards but so too will there be their counterparts and there is no good reason to believe that progress towards improvement for more and more individuals will continue as it has in the past. Of course a real catastrophe could change all of that, but our use of fossil fuels is not one of them. On the contrary they have fuelled the progress that we have seen during the past two centuries. Such have been the benefits stemming from our increasing use of fossil fuels that the human population has flourished in that time and promisses to continue doing so as it heads towards a nicely sustainable level of about 10Billion (http://www.prb.org/Educators/TeachersGuides/HumanPopulation/PopulationGrowth.aspx). We would be doing a grave disservice to the millions of humans who are still suffering real deprivation if we were able to cut the use of fossil fuels in the ridiculous manner that the Greens desire. That will only happen when those sources of energy run out and nuclear becomes the main source of energy supporting our growing economies. Despite oil being more and more difficult and expensive to extract from the earth there is still a lot left underground, as well as enormous stocks of coal and methane. What I find so upsetting and for which I see no solution is the dishonesty of our elected representatives. Shame on them for pretending to believe the CACC nonsense when all that they are really interested in is collecting as much money from the hard-working taxpayer as possible. They had hoped that pushing the CACC propaganda would make taxpayers happy to hand over much much more, but it is all backfiring on them, increasingly since the revelations of Climategate just before the UN’s COP15 fiasco in Copenhagen. When I started researching what is behind the CACC propaganda in 2007 after reading the booklet “Six Degrees: Our Future on a Hotter Planet” (http://www.amazon.co.uk/gp/product/images/0007209045/ref=dp_image_0?ie=UTF8&n=266239&s=books) by staunch environmentalist Mark Lynas I was a very concerned father and grandfather. The picture painted in his science fiction piece was frightening but careful inspection reveals the clever manner in which he merged facts and fiction in order to scare people into accepting the CACC faith. At that tie I wasn’t aware of the saying that if you are puzzled about something “Follow the Money”. It took exchanges with an Australian sceptic who uses the false name peggyB to open my eyes to the truth of that. Let me make a suggestion to Greens all over the world. If they want to attract support from thinking individuals rather than just from mindless activists stop distorting the facts, be honest about your objectives and stick to protecting the environment from real cases of unnecessary damage. One thing that they must do is recognise that changes made for the benefit of humans are welcomed by the majority of the most important of earth’s species, we humans. Have you heard the one about the Vicar admiring the winner of the village annual “best garden” competition? Vicar: “My my, God and you have made a wonderful job of that garden”. Gardener: “Well, that’s as maybe, but you should have seen the mess it was in until I took over”. Let’s not forget that CO2 is an essential life-supporting plant food, set to 1000ppm in the atmospheres within greenhouses. The earth’s atmosphere is only at 360ppm so it’ll be a while before it gets back to that optimum figure enjoyed during the Early Carboniferous and Jurassic periods (unless Mother Nature steps in with another ice age). There is a relevant article in Monte Hieb’s Geocraft article “Climate and the Carboniferous Period” (http://www.geocraft.com/WVFossils/Carboniferous_climate.html). Have a look at that “Millions of Years Ago” graph – a picture paints a thousand words. As Monte says “ .. our present atmosphere, like the Late Carboniferous atmosphere, is CO2- impoverished .. ”. No doubt I’ll be hearing soon from John Byatt (previously hiding behind the false name Cooloola) from Cooloola Cove with his usual invective and from his henchman Ross Brisbane (AKA DigitalAdvisor/ConcernedCitizen) from Brisbane trying to scare us all with another of his “tipping points”. Ah well, it takes all kinds. It seems that I have misled myself about the Australian Government, which I thought was a coalition of ALP and Greens. PeggyB corrected me on this but it still appears to me that the Greens are wielding far more power than their support warrants. Your picture looks like Phil Jones to me. Mental Aberration from overworked blogger. 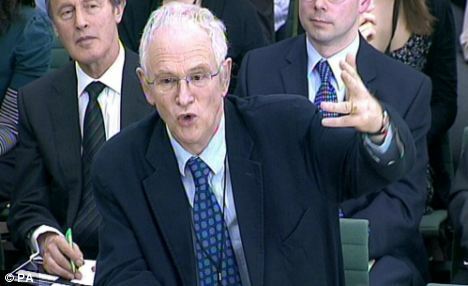 Hi Geoff, I’d thought that the use of that ‘photo of Dr. Phil Jones during the UK’s white-wash hearing by the UK’s Commons Science and Technology Committee (http://toryardvaark.wordpress.com/2010/03/02/climategate-phil-jones-at-the-commons-science-and-technology-committee/) was a deliberate reminder of the Climategate scandal. No, Pete, Just a late night mental aberation.